Bill Goff Inc. and Dugout Memories Inc.
Lithograph print measures 18" x 33"
It's the summer of 1955 in Brooklyn, and the Dodgers are in the midst of what will be their most glorious season in New York. They'll win 98 games and finally capture their first World Championship after seven World Series setbacks! That's Edwin Donald Snider at bat for Brooklyn in a game against the Pirates. The Duke's having a monster season. Before it's over, he'll hit .309 with 42 homers, a leading-leading 136 RBIs and a league-leading 126 runs scored. His favorite target, of course, is the inviting screen in right field fronting Bedford Avenue. From your upper deck seat on the third base side, the screen, the Schaefer scoreboard and the colorful right field billboards are in full view on a fabulous day in Flatbush . 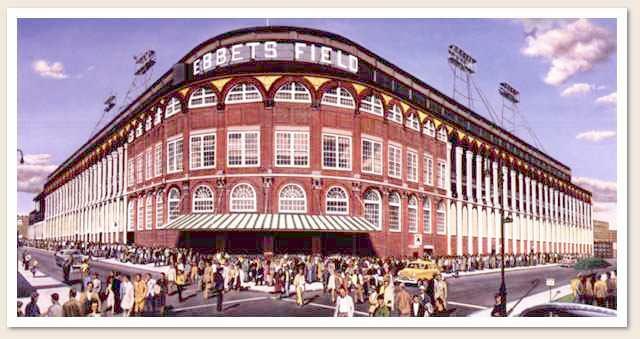 Lithograph print measures 22" x 30"
Beloved Ebbets Field and named after Dodger owner Charlie Ebbets. It opened on April 9, 1913, and served the burgeoning borough of Brooklyn, NY, until the Dodgers broke their fans' hearts and moved out following the 1957 season. It is the 1950s here, and you're looking at the ballpark's main entrance from the intersection of McKeever Place ( to the left) and Sullivan Place (to the right). Who would have believed then that the Grand Old Lady was in her twilight. In 1960, wrecking crews began moving in. Still so sad after all these years.